The tiles start off as raw terracotta clay, dug in Stoke on Trent. We extrude the clay, cut the lines of clay in to squares, leave them to behave themselves ( stacked up so they stay flat) and then apply several layers of clay “slip” in whatever colour is ordered – cream, ivory, or as in this picture, a soft yellow ochre. Ann working on a mural – murals can be ordered in any size. The whole process takes three weeks from start to dispatch. Ann working on a mural – it must be Winter, she’s in a woollie. We paint our murals onto raw clay, with slip colours. Then, using a sharp tool, we draw all over it, scratching lightly through to the terracotta clay beneath, This “sgraffitto” technique is what brings our murals to life. Many variations on the theme of Chantecler and his hens have been made in this workshop – no two are identical. Each one has its own unique character. “Chantecler”, is Chaucer’s cockerel. I’m afraid in the story, he doesn’t listen to his wife, and comes to a sticky end. We work from our own sketches, we don’t use transfers, just our own skills and knowledge of the ceramic materials we use, such as clay slip, underglaze colours, glazes and scratching through the upper layer of slip to create a fine, lively line. And it’s still a wipe-clean, durable surface – how great are tiles! Especially ours! 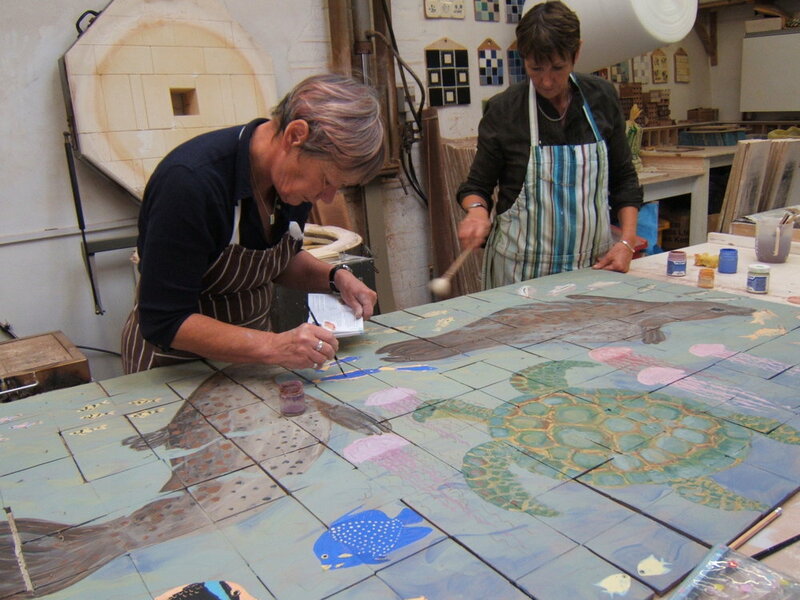 Here we are working on a commission – a series of large murals featuring sea-life – dolphins, turtles, fishes, crabs… every tile has been hand-made and is hand-painted.